Prince Creek has a secret. Hidden away from the noise and activity of Myrtle Beach’s Grand Strand, the gated community of Creek Harbour sits like a pearl within an oyster shell along Collins Creek. The luxury homes in this neighborhood sit on lots that often a half acre to 3 acres in size. Luxury homes with 3, 4 and 5 bedrooms are 2000 heated square feet or more, and several are larger than 6000 square feet. Many homes are brick and offer stunning outdoor living spaces, and beautifully manicured lawns. It is close to Prince Creek’s award winning golf course designed by Tom Fazio, The Tournament Players Club. Part of the St. James High School district, children attend school just a short 8 minutes down Highway 707. The Brand New Inlet Crossing Shopping Center with restaurants and renovated mall is 7.5 miles away. Brookgreen Gardens, the beaches at Huntington Beach State Park, and the Waccamaw National Wildlife Refuge are nearby as well. 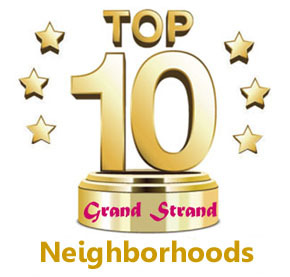 Of course, all the excitement of the Grand Strand is just a short drive away. Creek Harbour has it all. The perfect place to live, luxurious, peaceful, and quiet, with the extra security afforded a gated community, it is just a short distance from all the fun of the Grand Strand. If you would like to know more about Creek Harbour at Prince Creek, contact our Myrtle Beach real estate specialists for a tour. Let us show you how easy it is to own the home of your dreams. Listing courtesy of CB Chicora Advantage Surfside , Audrey Goldstein. Listing courtesy of The Litchfield Company RE , Will Davis.